Scotland is a beautiful landscape just made for self drive touring. That’s why, in my road trip planner, I’ll give you several touring routes reaching from the Borders to the Highlands, taking in some of the country’s most historic sites and scenes. Find out more here. In a blog post on the Visit Scotland website, Annierose Knox, one of their bloggers, has described “5 Beautiful Weekend Road Trips In Scotland”. Any of them would make wonderful add-ons to our tours. “There’s no doubt about it, Scotland is an awesome place to go for a drive. Endless long hills leading up to panoramic vistas, gentle winding roads through the quiet countryside and routes where you might not pass another car for miles (although perhaps the occasional wandering sheep) – what more could you possibly wish for on a road trip in Scotland? “No time? No worries. We’ve picked a few short road trips in Scotland that can be done over a long weekend or just a couple of days, depending whereabouts in Scotland you’re starting from. 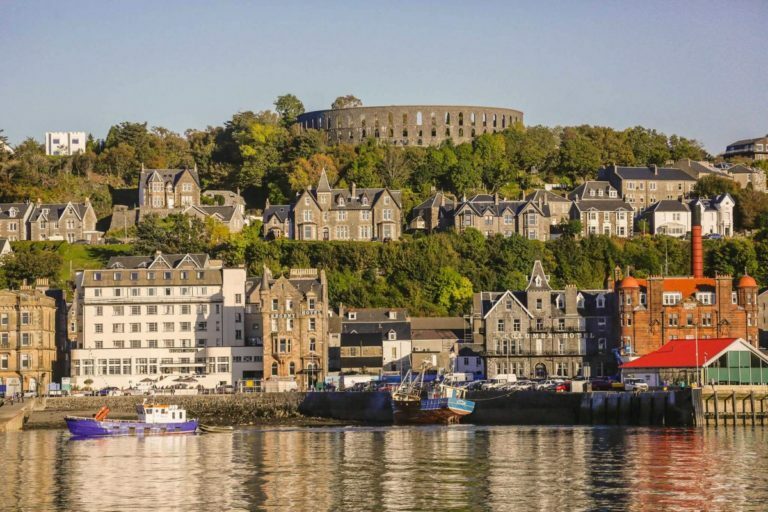 “All of these are perfect for 2-day road trips in Scotland (or even longer if you’re lucky enough to have some extra time).”She then describes visits to Oban (pictured), Aberdeenshire, Dunbar and North Berwick and even over the sea to Skye. Flee the city and drive from Glasgow for a weekend in the west coast. Travelling north west from Glasgow, along the A82, your first stop has got to be Loch Lomond & The Trossachs National Park, one of the great places to go for a drive from Glasgow. As well as Munros, lochs and forests to explore, the National Park has some beautiful drives of its own, with uniquely designed viewpoints installed throughout the landscape, including the An Ceann Mòrat Inveruglas. If you like a good dose of fresh sea air, the north east of Scotland won’t fail to deliver. Follow the signposted Aberdeenshire Coastal Trail for plenty of coastal wonders, including dramatic cliffs, hidden beaches, fascinating wildlife and quaint harbour towns. The Isle of Skye’s intoxicating scenery, with its windswept mountains, sheer cliffs and other-worldly geological features, make the whole island a fabulous driving destination. It doesn’t matter which direction you take, exploring the length and breadth of Skye will be a weekend well spent. Drive from Edinburgh for a weekend by the coast. The delightful towns of East Lothian are great places to go for a drive from Edinburgh and are ideal if you love to be beside the seaside, but don’t want to be in the car for too long. This drive will take you right across whisky country, into the peaceful countryside of Aberdeenshire where you’ll cruise past castles, rivers and of course, distilleries. Travelling from Inverness to Nairn, make a stop at Nairn Beach, a pristine white sandy beach ideal for picnics! For more details on each of these great Scottish road trips and inspiration on how to spend quality time on the road in Alba go visit the Visit Scotland blog. You can also get more Scotland road trip ideas by subscribing to my website.